At the end of the legendary Avenida Diagonal, an urban rebirth has taken place: Diagonal Mar. A 35-acre public park, three lakes, and walking and biking trails surround this mixed-use development, making for the city's hottest new residential and tourist destination. With five independent residential developments, three world class hotels, three Class A office buildings, one of Europe's largest convention centers and Catalonia's largest shopping and leisure center, Diagonal Mar offers it all. Come experience the Mediterranean lifestyle. 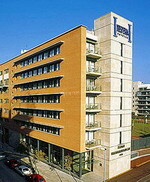 The NH Hesperia Barcelona del Mar in Barcelona is a seven-storey modern hotel set on the seafront in Diagonal Mar, 250 metres from the beach and three kilometres from La Rambla. In house dining at Hesperia Del Mar includes Bar-Restaurante Noray, which combines fine dining and drinking in a formal setting decorated in beige and cream with marble flooring; serves regional and Mediterranean dishes such as Iberian Ham and Salted Cod. Nearby attractions include the Olympic Port, which is 1.5 kilometres away and the Museum of Modern Art, which is two kilometres away. Gaudi's unfinished masterpiece La Sagrada Familia, the Picasso Museum and the Old Port are all 2.5 kilometres away. 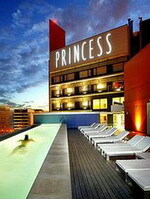 The Barcelona Princess hotel is perfectly located in central Barcelona next door to the Convention Centre, 24 kilometres from El Prat International Airport. 4 kilometres away is Las Ramblas, where guests can enjoy street theatre, cafés and shopping. The Picasso Museum and the Gothic Quarter are both 2 kilometres away from the hotel. Guests can enjoy a variety of outdoor activities along the beaches of the Mediterranean Sea, just 600 meters from the Barcelona Princess. The cities integrated bus and metro systems provide inexpensive and efficient ways to reach other interesting sites. Guests at the hotel can keep up with their workout routines in the fitness centre, and relax in the steam room, sauna or hot tub. Two outdoor heated pools offer guests opportunities to swim or relax in a lounge chair with a drink from the poolside bar. The Husa Barcelona Mar is a deluxe hotel located in the modern residential district of Diagonal Mar, only 300 meters from the beach. This contemporary hotel offers a full range of modern comforts and conveniences. It even has its own fine dining restaurant with an exquisite range of dishes. After just a short walk into the sea breeze, guests will arrive at the Barcelona Olympic Port, where they may choose from a variety of restaurants, bar and attractive venues, for daytime enjoyment and nightlife, too. Public transport can be accessed close by, and the El Clot rail station is within walking distance. 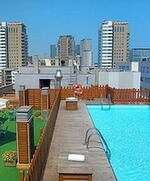 There is an outdoor swimming pool, as well as a terrace, for the guests' enjoyment. There is also private parking for those guests arriving by car. The Husa Barcelona Mar is convenient to fine dining, shopping and entertainment venues. The modern Vincci Maritimo is located in the Diagonal Mar area of Barcelona, Spain. 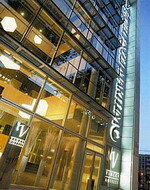 It is just 200 metres from the Forum International Convention Centre and five kilometres from the city centre. Barcelona Airport is ten kilometres away. Opened in 2003, the modernist-inspired Vincci Maritimo hotel has a contemporary lobby flooded with natural light. A range of watersports are available at the nearby beach. The hotel's restaurant serves a buffet breakfast and modern Mediterranean cuisine, including dishes like sea bass, grilled asparagus and beef carpaccio. The slate-floored restaurant looks out over the hotel's patio and a park. In the summer, tables are laid out on the patio for alfresco dining.